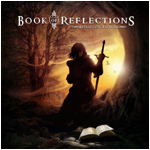 Never one to sit still, guitarist/composer LARS ERIC MATTSSON resurrects BOOK OF REFLECTIONS for the stampeding metal attack of “RELENTLESS FIGHTER”. Joined by two killer vocalists in CARSTEN ‘LIZARD’ SCHULZ (Evidence One, ex Domain) and MARKKU KUIKKA (Status Minor), Mattsson has penned 10 new tracks which are firmly rooted in a neo-classically tinted metal framework along with the usual ‘outside-the-box’ Mattsson musical trickery. Whilst there are two prior chapters to the Book Of Reflections story in the self titled debut and its follow up ‘Unfold The Future’, the new album is heavier, more direct and with more potent songs. Mattsson himself concedes, “Stylistically it’s closer to the debut than the second album but the songs are better and the sound is a step on too. The idea was to make a rocking album with some cool details but nothing too complex. The songs all fit together and complement each other rather than having material that is too diverse. This was also the main idea behind the first album while on the 2nd album things were a bit too spread out and it maybe lost some focus as a result”. • Dance With the Devil. • Angel Shed a Tear. • Somewhere Else to Be.